Hello everybody and welcome back to my blog. Thank you for coming back and reading my blog. In my last post I talked about general message handling and briefly touched on the Standard ARRL Radiogram message format. In this post we will go into further detail of it. Above is a example of a filled out radiogram. If you read my last post, then yo have already seen this, but I figured I’d show it again before we break it down and talk about it in more detail. The first part of the radiogram that we are going to talk about is the preamble. The preamble, sometimes referred to as “the header,” consists of administrative data such as the message number, originating station, message precedence(importance) and date and time of origination. The combination of the message number and the originating station serves as a unique message identifier, which can be traced if necessary. The first block is the Message Number. This is any number assigned by the station that first put the message into ARRL format. While any alphanumeric combination is acceptable, a common practice is to use a numeric sequence starting with the number 1 at the beginning of the emergency operation. Those that regularly participate in day-to-day message handling may start their number sequences at the beginning of each year or month. The second block is the Precedence. The precedence tells everyone the relative urgency of a message. Within the ARRL format, there are four levels of precedence. Welfare(W): This type of precedence is used just as you would think it would be. It is used as to the health and welfare of someone in a disaster area or as a message from someone in the disaster area to friends and/or family outside of it. If someone inside the disaster area wants to let their parents know that they are ok, but normal communications are down, this precedence type is used. Priority(P): Priority messages are important messages with a time limit or any official or emergency-related messages not covered by the EMERGENCY precedence. This precedence is usualy only associated with official traffic to, from or related to a disaster area. Emergency(EMERGENCY): This precedence is always spelled out and is used for any message having life or death urgency. Also included in the emergency precedence is official messages from agencies requesting critical supplies or assistance during an emergency. The precedence should be limited to traffic originated and signed by authorized agency officials. This type of message should only be communicated via amateur radio if no other means of communications is viable because of the lack of privacy with amateur radio. HXA(#) – Collect telephone delivery authorized by addressee withing (#) miles. If no number is sent, distance is unlimited. HXB(#) – Cancel message is not delivered within (#) hourse of filing time. HXD – Report to the originating station the identity of the station who delivered the messages, plus date, time and method of delivery. Also, each station to report identity of station to which relayed, plus date and time. HXE – Delivering station to get and send reply from addressee. HXG – Delivery by mail or telephone, toll call not required. If toll or other expense is involved, cancel message and send service message to originating station. The fourth block is the Station of Origin. This block contains the callsign of the first station that put the message into NTS format. It is not the message’s original author. Block number five is the check block. This contains the word count of the text portion only, including periods that are written as X and spoken as X-Ray. After a message is received, the receiving station will count the words in the text area and verify that the word count matches the number in the Check block. If the count does not match, the message should be re-read by the sender. If the message was received correctly, but the count is still off, the receiving station will change that box to read the original number followed by a slash then the corrected count number. For example, the original count was five and the correct count is six the check box should be changed to 5/6. Block number six is the Place of Origin. This is the name of the community, building, or agency where the originator of the message is located. This is not the location of the station that first handled the message. Block number seven is the Time Filed box. This is an optional field unless the precedence is set at HXB. It doesn’t have to be filled out for routine messages but it is recommended that it be used for welfare, priority and emergency messages. A lot of hams use UTC time when logging, however, during a disaster it is better to use local time followed by the timezone abbreviation to eliminate any confusion by served agency personnel. Finally we come to block number eight which is pretty self explanatory, the Date. This is the date that the message was first placed into the traffic system. Make sure that you use the same date as the time zone indicated in the time field. The next section is the address area. This section has the recipients name, address, and phone number. The signature line is important to have on any message because of authorization requirements of some agencies. If you read my last blog post, you have already read about the importance of a signature in detail so I wont go into it again. If you have not read my last post, Message Handling, you might want to. 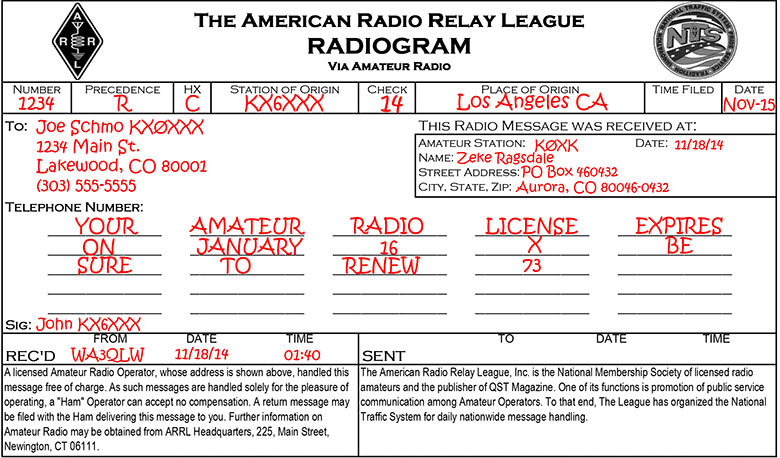 The last section of the Radiogram is the above area, this information is filled out by each operator as they receive the message and is not sent with the message. This is for logging/record keeping purposes only. Â END AR* Â End of message. Â MORE Â B Â Additional message to follow. Â FIGURES Â Not Needed Â Used before a word group consisting of all numerals. Â INITIAL Â Not Needed Â Used to indicate a single letter will follow. Â I SAY AGAIN Â IMI* Â Used to indicate a repeat of a word or phrase will follow. Â LETTER GROUP Â Not Needed Â Several letters together in a group will follow. Example: ARES, SCTN. Â THIS IS Â DE Â Used preceding identification of your station. Â HX Â HX Â Handling instructions, single letter to follow – optional part of preamble. I think that pretty much covers everything that I can think of pertaining to sending and receiving radiograms. I would like to thank yall again for reading my blog and please share these with your friends. Please like my facebook page and follow me on twitter, links to both can be found in the top right corner of this page. In my next post we will be talking about NIMS training, so please subscribe, like or follow me to know when it comes out(probably Thursday).